This attractive urn style rain barrel with planter allows you to grow a plant, while collecting warm, chlorine free rain water, which your other plants will love. The rain barrel is made from durable, u.v. resistant plastic designed to look like an adobe clay urn and contains recycled content. 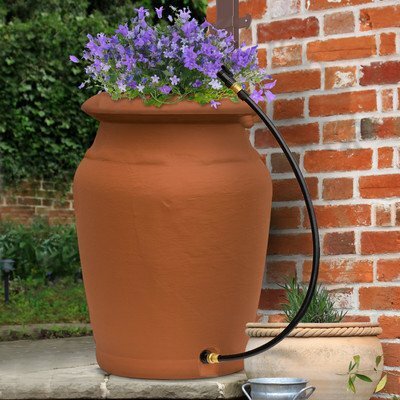 It also includes an easy screw on 3 ft. hose with shut off valve, hanging clip and elbow, which makes watering and set up easy. Conserving water is not only good for the environment, it can also save you on your water bill. If you have any questions about this product by Forest City Models and Patterns, contact us by completing and submitting the form below. If you are looking for a specif part number, please include it with your message.